Commonly called the Combat Area. Combat area land purchase and construction separate and done later than the main depot. The Edgemont Tribune; Jan. 3, 1945; Additional cables are being strung to the General Supply area, in order to install telephones in all the warehouses and to give additional service to the office buildings in the Area. 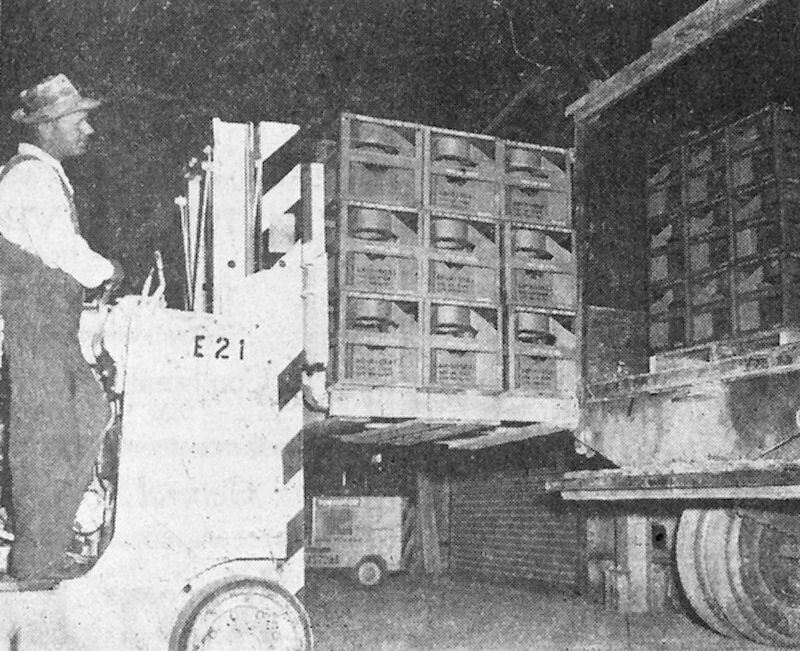 blueprint M1-478-1; Jan. 13, 1945; 15-14; firewalls added to OS-1 warehouses no. 1822, 1823, 1824, 1825 and 1827. 1822 and 1823 have concrete floors while 1824, 1825 and 1827 have earth floors. One of the many functions of the Black Hills Ordnance Depot is storing and maintaining of Ordnance general supplies. All Ordnance material except ammunition is considered general supplies. It may be a complete unit such as a truck, tank, gun or the spare parts, tools and equipment required for their maintenance. Numerous standard hardware items, target material, and supplies for cleaning, preserving and welding are also included in Ordnance general supplies. A percentage of each item in storage must be inspected annually to determine the state of preservation. If the inspection indicates rust, corrosion, or other deterioration, the item may require complete processing to prevent further deterioration. The goal of the Ordnance Corps is proper packaging of material to withstand ten years in storage in any type of climate from the extreme cold of the Arctic to the hot humid temperature of the tropics and the salt atmosphere of the sea without additional work. Any item, regardless of intial cost, is useless to troops in the field if it arrives rusted, corroded, broken or in an otherwise unservicable condition. Due to the large variety of general supplies, such as ten thousand separate parts to some vehicles, specifications are written in broad terms. The cleaning, preserving and packagine of each item depnds upon the material, size, weight and eventual use of the item. As an aid in standardizing packaging methods, the Ordnance Corps conducts a packaging and packing course. A very comprehensive course in cleaning, preservation, packaging, packing and marking of military supplies and equipment is offered. Members of all the Army technical serices, the Navy, the Air Force and industry attend the school. Newly manufactured items, although appearing spotless to the naked eye must be thoroughly cleaned to remove any factory residue which may cause corrosion. Employees processing items must wear gloves since most items touched by bare hand must be bathed in fingerprint removing solutions to prevent corrosion. All rust preventative coumpounds, cleaning solvents, wrapping papers, tapes and other materials must undergo extensive laboratory testing before they are apporoved for use in packaging. 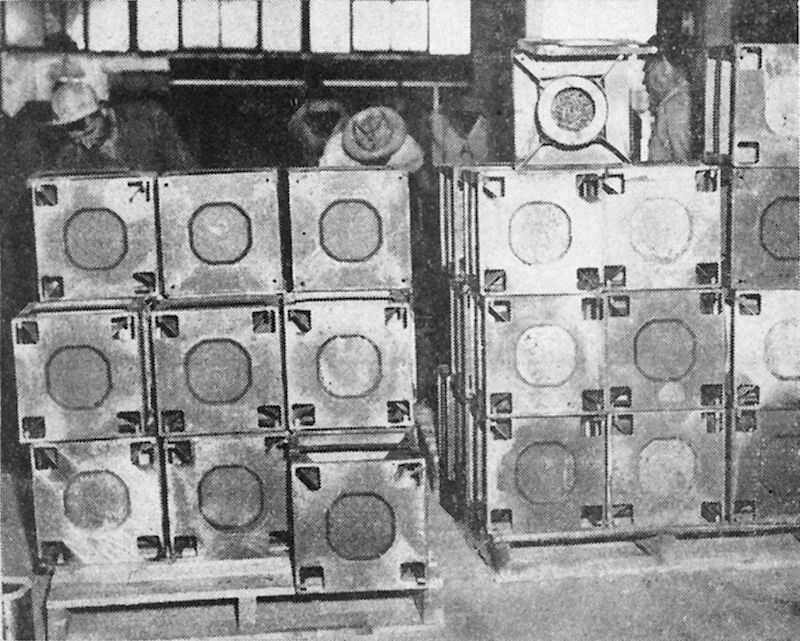 Shown in the photograph above are springs being processed for shipment overseas. Within a few hours after the last spring had been processed, they were loaded into a freight car and on their way. 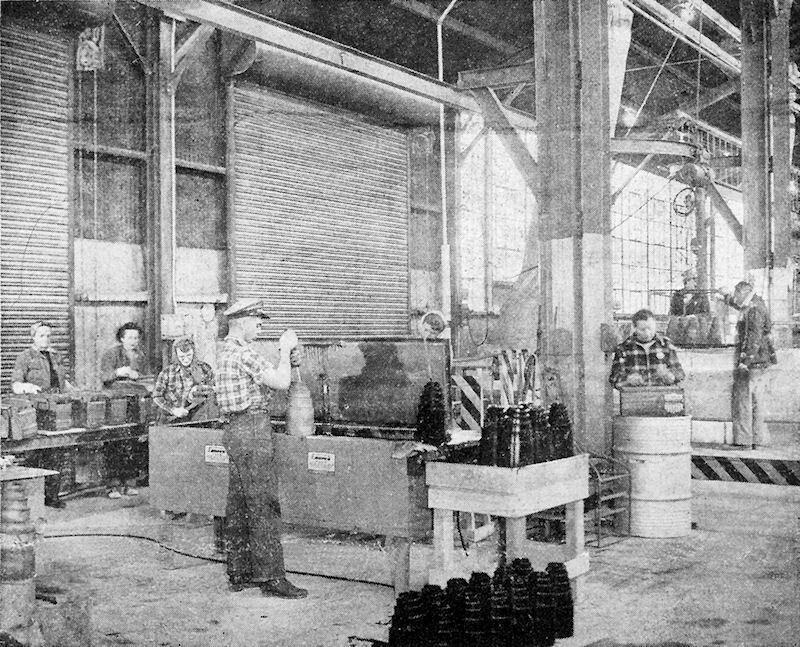 In the lower left background, workers are cleaning ammunition chests during annual inspection. Some jobs operate around the clock to get full utilization of equipment. Tyupical of this type operation is the processing of bomb fins that are being de-rusted by sandblasting and painting with rust inhibiting enamel. Some of the latest types of equipment are utilized in processing material, such as a water curtain paint spray booth and a vapor steam degreaser. Soon to be installed to aid in rust removal will be an airless blast machine and infra-red ovens to speed paint drying. "Our job is to get the needed material - in the right place - on time - enough - correctly packaged." The General Suppluy Branch recently instituted a 10-hour course in preservation, packaging and packing of military supplies and equipment. The objective for supply facilities, in recent years, is to establish and maintain close coordination and control of all phases of preservation and packaging of equipment and supplies for readiness to the armed services. Many new methods have been installed and through their utilization will protect materials from deterioration and damage by moisture, living organisms, or from handling. The primary purpose of the training course is to give to workers the latest methods being used, as well as a better understanding of their jobs and to point out to each employee the important part played by them in supplying our fighting men with the materials they need. The course stresses cleaning and drying, wrapping, protection by fiberboard containers, wood boxes, cans and drums, cages and crates. Conducting the course is William Benett, Chief of the General Supply Branch and Olaf Olson, Packing and Processing Foreman. Attending the course are the following Supply Branch employees; Edward Aman, Michael Dowd, Garry Doyle, William Ehrier, Earl Hildeman, James Lanphear, John Peterson, John Ryan, Rose Campbell, Eleanor Eastman, Pearlbetty Ehrier, Delores Hammond, Elizabeth Heier, Florence Mastrovich and Florence Tuma. Colonel H. G. Hamilton extends hearty congratulations to Bill Bennett as he presented Bill with the Fifth Army's Safety Award. The beaming Chief of General Supply Branch proudly accepted the award while part of the branch's 250 employees smiled in approval. Meriting the award, which is given for one year without a lost time accident, is quite an achievement. 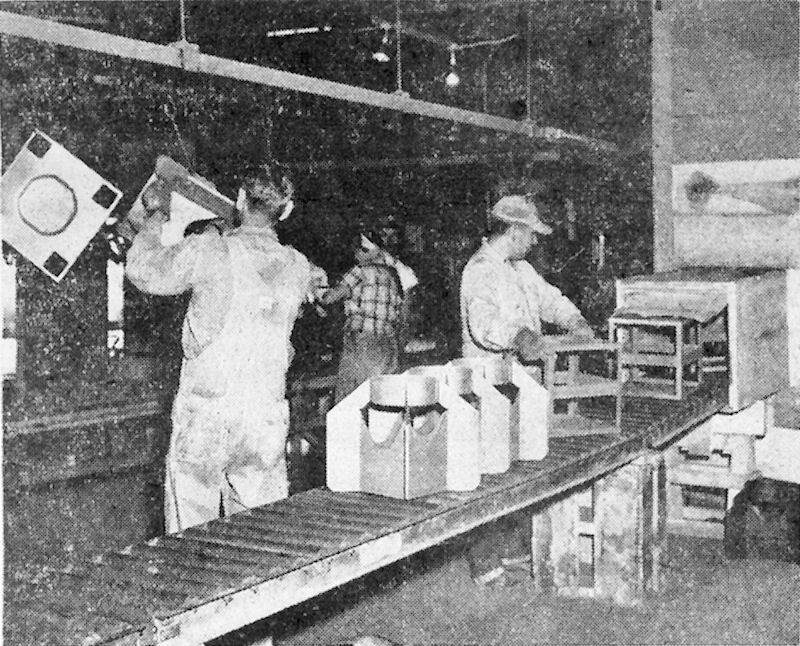 The employees of the branch, which embraces the processing line in Building 1913, warehouses, inspection of General Supply materials, as well as shipping and receiving, are constantly meeting deadlines. During the processing of 50 cal. ammunition in 1813, less than 200 employees averaged more than a half million rounds daily from the point of linking and belting to shipping. Safety Director Selmar Skaar points out that the 50 cal. line led all government installations in the repack project, proving that a safe job is an efficient job. In processing 190,000 bomb fin assemblies, up to November 1, the Black Hills Ordnance Depot expects to save $71,700 in 68 working days by using an efficiently planned processing line. Following nine years of open storage, the ravages of nearly a decade of wintery blasts and blistering summer sun, make the renovation of the assemblies a seemingly Herculean job. By use of manuel labor, it was. 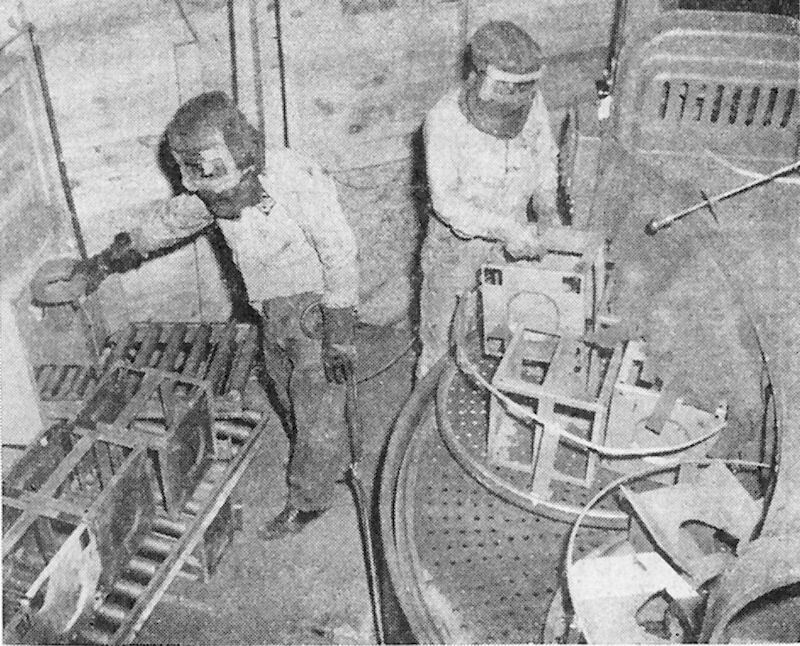 On past orders for refurbished fins, when the cleaning, sandblasting, painting, and reassembling was accomplished by manuel labor, the cost per unit was 58.9 cents and 3.01 units were ready for shipment per man-hour. New mechanical equipment was installed about a year ago and enough was saved on the first two jobs to more than compensate for the expenditure. On the present run, the cost per unit is 20.6 cents, or a savings of 38.1 cents over the manuel operation and the production is upped from 3.01 to 6.59 units per man hour. A remarkable thing about the General Supply Processing branch is its versatility. For several months it was engaged in belting and repacking over a half million rounds of 50 caliber ammunition a day. When the job was finished, and the fin project was ready to be under way, the conversion took just a little over six hours. bombs within a matter of hours - hundreds of miles away. These members of the distaff side of BHOD's processing staff in General Supply are, front to back, Verine Laffety (left), Nancy Lamont, Alice Nelson, Viola Hornbeck, Alene Wenzel, Julia Birdsall and Mildred Jones. They are assembling and stenciling the fins on two sides with pertinent, coded information. The fins, with the yellow stenciling standing out on the dark green backgound like the Black Hills sunrise, are then ready for shipment. At left background painted parts are emerging from the infrared dryer. (Editor's Note - In our special County Fair edition last week we did not have room for all of the pictures covering the bomb fin procesing story. Here are a few more pictures showing different operations of the interesting project. The rotor-blast blows particles of sand against these corroded fins at the terrific force of 125 pounds per square inch and in about a half minute they as clean as the proverbial hound's tooth. 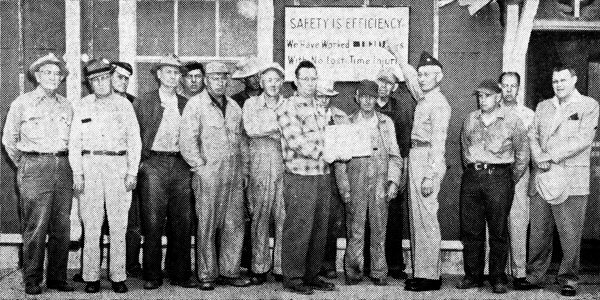 The workers with the "Men of Mars" regalia are Louis Pattee and Stanley Irving. Emerging from the rotor-blast as shiny as a newly-minted coin, the bomb fin assembly arts are hung on the conveyer to go to the paint tank. 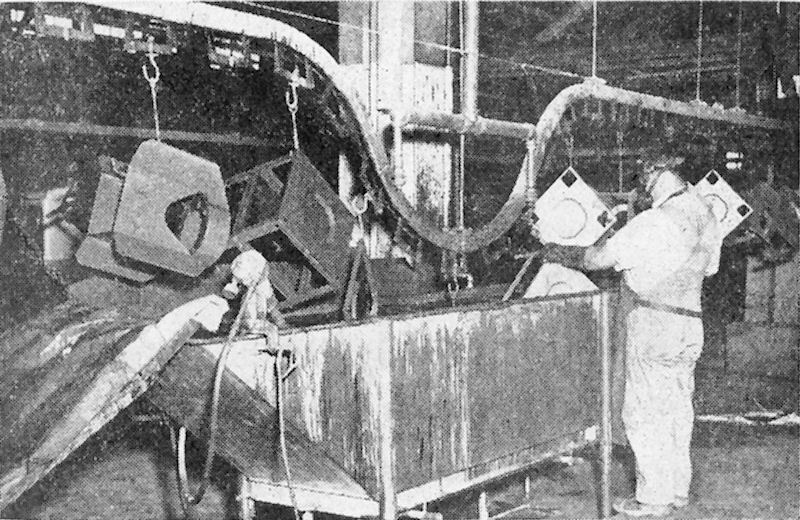 Emil Myers has back to camera as Eugene Black Feather takes assembly parts from the rotor-blast. Dipped into a tank of olive drab paint for a protective coating against rust, the fins move into a battery of 450 infra-red lights, generating 375 degrees fahrenheit. By the time they reach the end of this twenty foot dryer, they are bone dry and ready for further processing. Caring for the paint operation is Wilbert Blackfeather. 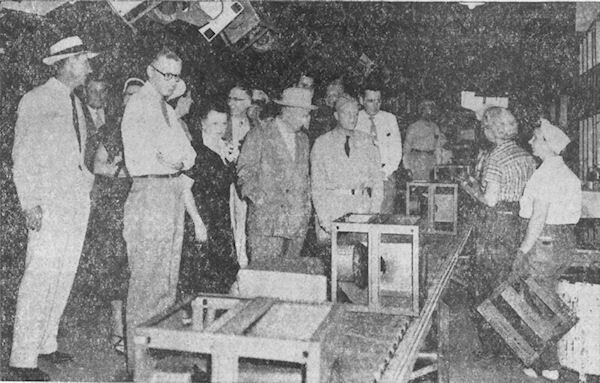 Viewing the bomb fin renovation line on a visit to Black Hills Ordnance Depot, Senator Karl E. Mundt was impressed with the transformation of rusted old fins into sparkling new units at a cost of 21 cents each. In storage for nine years, the fins which would today cost in the neighborhood of $7.00, are being stenciled with pertinent codal information. In the visiting party were, left to right, John B. Sweeney, Civilian Executive Assistant; Gerner Olsen, Chief of Storage Division; Mrs. Paul N. Wickens; Fritz Behrens, secretary to the Senator; Mrs. Roy B. Southworth, Jr.; Mrs. Karl Mundt; LeRoy F. Holst, Public Information Officer; Capt. 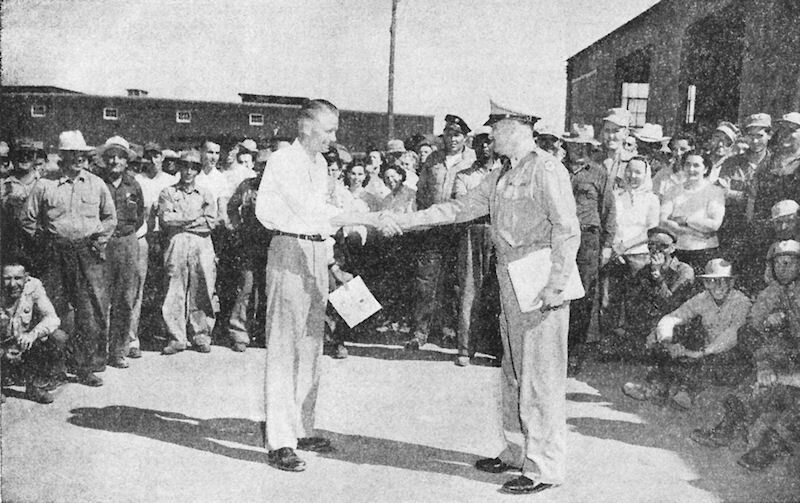 Raymond Demski, Post Engineer; Senator Mundt; and Colonel Paul N. Wickens. BHOD's Commanding Officer. Behind the Senator and Col. Wickens are George Hall, Assistant Chief of Storage Division; Lt. Col. Roy G. Southworth, Jr., Executive Officer; and Duane McDowell, also secretary to the senator. Doing the stenciling are Mrs. Anna Schramm, with checkered blouse; and Mrs. Nina Nygarrd. 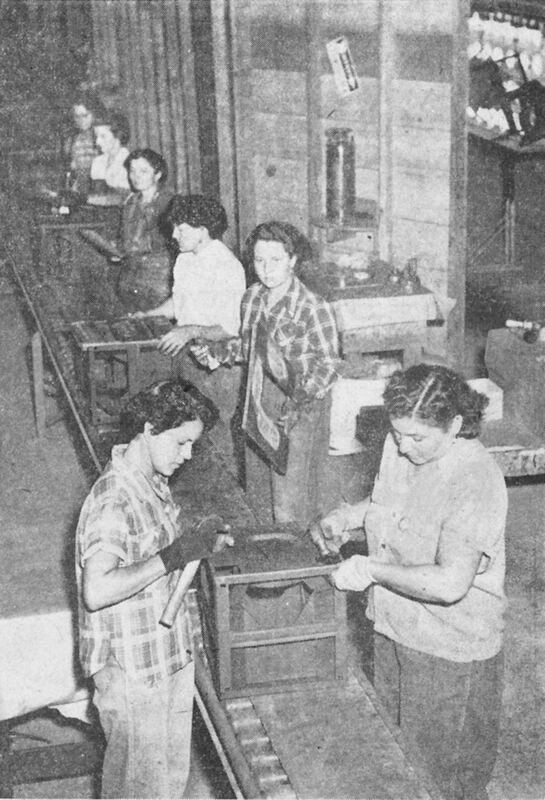 Shown at the far end of the assembly line are Elbe Ladwig, Surveillance Inspector, and Elvira Lenhoff. MAJOR JOHN BLETTE, presently Commanding Officer of BHOD, is shown adding another day to the 1830 days of no man hour loss of time due to injury for the entire General Supply Section of the Storage Division. Chief of the Section, John Mutschler, has just received the five year award for his co-workers, shown left to right: George Smizer, William Silvernale, John Donbraska, Press Davis, Marion Burr, James Librcajt, Clifford Olson, John Britton, John Mutschler, George Rose, Julian Traphangen, William Riley, Commanding Officer Major John Blette, Lawrence Schuring, Geddis Nelson, Chief of the Ammunition Branch and Gerner Olsen, Deputy ASO.